Your friend, Tamara Lynd, has asked you to come to Tresyllian Castle to investigate a ghost. Arriving at the castle at 7:00pm, you meet Tamara and the occupants of the castle and have dinner with them – but you also have to take part in a treasure hunt while trying to identify the ghost. Where the treasure is, what the treasure is, and who the ghost is changes in each of the four variations of this text adventure, depending on what you enter as your favourite colour (red, yellow, green or blue). Some of the variations are very interesting... This is one of the easiest of Infocom's text adventures; it's so easy that even I completed it quickly, and I'm not a big fan of text adventures. As a result, there's little else to merit the game. Princess Lalena has been captured by the Dark Lord, and you have to rescue her by battling through four levels of platforming action and collecting the three parts of Moontorc on each one. Each level has three shops where you can buy the parts of Moontorc, as well as keys – a lot of extra objects are hidden behind coloured doors, and making a map is almost essential since you may well have to restart the game if you don't have the right key – very annoying! Despite this, the game is actually very good (especially the graphics) and probably the best game that Atlantis has released. At the height of his stardom, Michael Jackson was so popular worldwide that he made a movie called Moonwalker. Later, in 1989, there was a computer game. 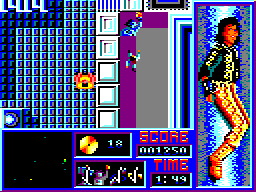 The first two levels are top-down maze-style screens, exploring and locating objects to make up MJ's clothing and motorcycle. 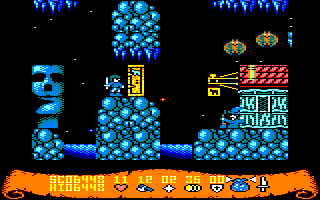 The third level is a side-scrolling affair; here you must find ammo and a machine gun in order to shoot bad guys in a club. On the fourth and final level MJ morphs into a robot, shooting soldiers as well as some type of ray cannon by controlling a crosshair. Although you get heaps of lives to complete each section, it's rather hard and very frustrating. 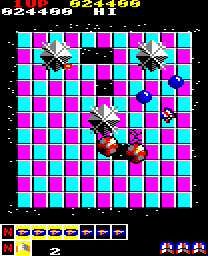 The graphics, while colourful, are quite blocky and flicker while MJ moves. It must be noted this home computer version is not in any way like the arcade version which is rather good and fun to play. 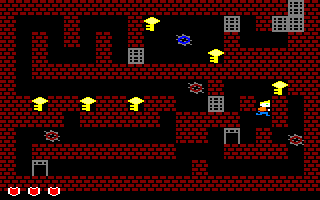 More Than a Prison is a maze game that genuinely represents the early- to mid-1980s games. You take control of an inmate and you must guide him to escape from the prison. Fortunately for us, the gamers, it is quite challenging and entertaining trying to do this. You need to grab the keys, open the doors and avoid some enemies that look like wheels with blades, but one type of enemy homes in on the poor prisoner until it kills him. Precision is essential if you are to escape! The levels are cleverly designed and the difficulty level rises reasonably from screen to screen. Both the tune and the entire game feel like they were written 30 years ago! I think the game deserved a better rating than it received in the 2015 #CPCRetroDev Game Creation Contest because I really enjoyed its overall presentation and gameplay. Morris the car is in a multi-storey car park and has to get out – but the Phantom, Phreaky, Phearsome Kamikaze Bikers from the constellation of Morris Minor are driving manically around the car park! Honestly, this is the actual scenario of the game! 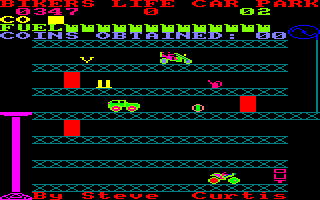 You have to use the lifts to collect ten coins, while warding off the Bikers with your horn, and avoiding the parking fees (represented by pink boxes) and other hazards. 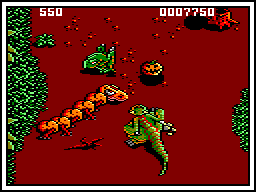 Because of the year the game was released, the graphics and sound effects are primitive, and the gameplay is very simple. It's OK, but all the screens are the same, so it becomes repetitive. Mot is a monster who lives with a boy called Leo, and he has the ability to teleport to other worlds. This game consists of three parts, the first of which sees you as Leo in his house, attempting to lead Mot around the house to the portal that will take you and him to Mot's world while trying not to annoy Leo's parents too much. In the second and third parts, you control Mot in a vertically scrolling beat-'em-up where you must fend off all sorts of weird and wonderful enemies. The graphics are beautifully drawn and very well animated; the reactions of Leo's parents in the first part are particularly amusing! Unfortunately the first part is quite frustrating to play, although thankfully the other two parts can be played without having to complete the first one. Watch YouTube videos of this game by: jgonza (introduction), jgonza (part 1), jgonza (part 2), jgonza (part 3). Fancy testing your skills on an off-road scrambler bike? Then try this. On each level there's an obstacle course where you jump over logs, rocks and chasms, and a time trial section where you have to complete the course within a time limit. 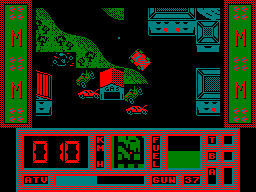 The graphics are all right, although the colours used are horrible, and the music is OK too. The sound effects are limited to the humming of your engine, and in fact, it looks like you're doing about 10mph on the obstacle courses! It is let down by the game not being at all easy to get into – getting your bike over the first obstacle can be a feat in itself. 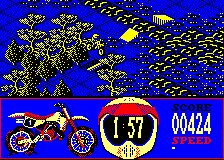 This game's all about time trials, as you negotiate your dirt bike through an obstacle course within four minutes. Among the obstacles to be cleared are ramps, ladders, planks, rough ground, steep hills, and the odd Volkswagen Beetle as well, and there are seven courses. However, getting off the first course is impossible – your bike is difficult to control, and some of the obstacles require a ridiculous degree of precision. The isometric graphics are nice, and there's a picture of your bike falling apart as you keep crashing, but the game is so difficult that it's not worth bothering with. Dr. A. Noid has turned the Earth's inhabitants into zombies by feeding them with the addictive food substitute Slu. A reward has been offered to stop him, so you decide to stop him. You must drive around three cities in your All-Terrain Vehicle (ATV) and explore buildings to find food, ammunition, extras for your ATV, and ultimately, a pass to enter the arena, where you participate in an all-out demolition derby and knock cars out of the arena. Survive this, and you can go to the next city. The graphics aren't up to much, and for some reason, there are no sound effects on 64K machines (although there is a tune). There's also quite a contrast in the difficulty; the city sections are easy, but the arena is quite tough, and making a single mistake in the arena can often mean the end of the game. This is a game where you must bounce all the enemies off the platforms on each level, but they'll also try to bounce you off! On later levels, you can collect power parts and jump parts to make things a little easier, and if your time gets short, holes will start appearing in the platform as you are shot at! 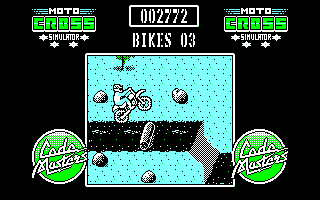 The graphics are fairly colourful but still garish, and there's a cool tune to go along with it. The range of enemies is also quite satisfactory, and all in all, it's quite a lot of fun to play.